When the Heisman Trophy winner is announced Saturday, he will etch his name in history. Maybe it’s just me, but I always notice the Heisman Trophy runner ups. These guys are always great players, but because they came up just short and finished in second, they’ll never have the eternal recognition that goes along with winning the Heisman. My interest in Heisman Trophy runner ups surely relates to the fact that I’m an Iowa fan. The Hawkeyes are tied for second in college football in the number of Heisman Trophy runner ups. Oklahoma has had five players finish second in the Heisman balloting, while Iowa, Tennessee, and USC have each had four Heisman runner ups. If Notre Dame linebacker Manti Te’o finishes second in the balloting, the Irish will join that list. Angelo Bertelli in 1941, Joe Theismann in 1970, and Rocket Ismail in 1990 are the three Notre Dame Heisman Trophy runner ups, and Te’o could make four on Saturday. The four Hawkeye players who finished as Heisman Trophy runner ups all had outstanding careers at Iowa. Let’s take a look at their remarkable careers. 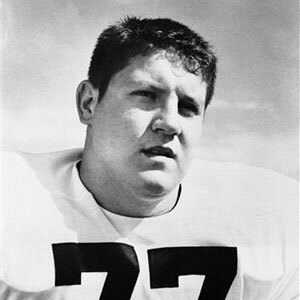 The first Hawkeye to finish as a Heisman Trophy runner up was Alex Karras in 1957. I wrote about Alex Karras in an earlier post. He helped lead Iowa to a Big Ten championship as a junior in 1956, and he came back as an even stronger force as a senior. In 1957, the Hawkeyes went 7-1-1; their only loss was in the de facto national championship game at Ohio State, 17-13. Karras won the Heisman Trophy balloting in the Midwest region in 1957 but lost the overall vote to John David Crow of Texas A&M. Crow is the only Texas A&M Aggie to win the Heisman Trophy, but Johnny Manziel will try to change that on Saturday. As a tackle, Karras was a long-shot candidate in the first place. He won the Outland Trophy as the nation’s top lineman, but linemen are never really contenders for the Heisman. That made Karras’ second-place finish all the more remarkable. Karras’ second-place finish was the highest ever for a lineman, and 1957 turned out to be a banner year for big men. Lou Michaels, a tackle from Kentucky, placed fourth in the voting, giving tackles two of the top four spots…a very rare occurrence indeed. The following year, Iowa went back-to-back in Heisman Trophy runner ups. Randy Duncan, Iowa’s magnificent quarterback in 1958, set several school records while leading the Hawks to the Big Ten championship and a Rose Bowl victory as a senior. Like Karras, Duncan won the Heisman Trophy balloting in the Midwest region. However, Duncan came up short to Pete Dawkins of Army. 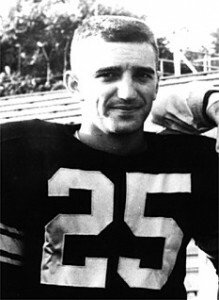 Army football was a national powerhouse in the first half of the twentieth century, and Dawkins’ victory in 1958 marked the 14th time an Army football player had placed in the Heisman Trophy balloting. It proved to be Army’s last hurrah; the only Army player to place in the Heisman voting since Dawkins was Mike Mayweather’s tenth place finish in 1990. Randy Duncan went on to be drafted #1 overall in the 1959 NFL Draft and was later inducted into the College Football Hall of Fame. It’s too bad that this prolific quarterback didn’t claim college football’s biggest award, but Pete Dawkins went on to do Army proud and become a legitimate standout in athletics, academics, military service, and business – so there’s no shame in coming up short to him. Chuck Long was no stranger to the Heisman Trophy spotlight in 1985; the year before, Long finished seventh in the voting as Boston College’s Doug Flutie ran away with the award. Long garnered 37 points in the voting, giving him one point more than a senior wide receiver from Mississippi Valley State. It wouldn’t be long before that receiver, Jerry Rice, established himself as the greatest wideout the game has ever seen. 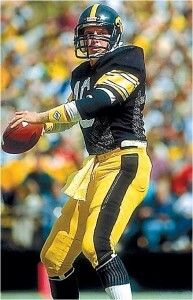 Chuck Long won three of the six regions, the only Hawkeye to ever do that. In 1939, there were only four regions, and Nile Kinnick won two – the Midwest and the East – on his way to claiming the trophy. Aside from Kinnick winning the East in 1939, Chuck Long is the only Hawkeye to win any region other than the Midwest in the Heisman Trophy voting. Long won three regions in 1985 – the Northeast, the Southwest, and the Far West. Jackson finished second in those regions; in the other three regions, Jackson finished first and Long came in second. What sunk Long, in my opinion, is that one of those regions, shockingly, was the Midwest. For some unknown reason, Chuck Long finished second in his own territory, and that was enough for Jackson to pull out the closest Heisman Trophy vote in history at the time. Jackson edged Long, 1,509 points to 1,464, a difference of just 45 points. Bo Jackson, of course, signed a deal with Nike and became incredibly famous. Chuck Long, who threw for over 10,000 yards in college, earned a place in the College Football Hall of Fame but sadly will never have the national fame Jackson enjoys. Then again, Long has had a more memorable sports career than Dudek, who earned 56 points in the 1985 Heisman balloting from all those “thinking fans” out there. So there’s that. All this brings us to the most recent brush Iowa has had with winning that elusive trophy, exactly ten years ago this year. That season, Brad Banks appeared from out of nowhere to make a serious run at the Heisman. Unlike Karras, Duncan, and Long, Banks was a transfer who only played two seasons at Iowa. He played sparingly as a backup in his junior season before bursting onto the national scene as a senior. 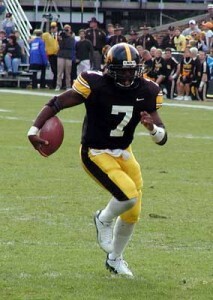 In 2002, Brad Banks threw 26 touchdowns along with just five interceptions to lead Iowa to a Big Ten championship and its first undefeated season in conference play in eighty years. Banks made a late push for the Heisman and was considered by some to be the leading contender for the trophy until the final day of the season, when USC’s Carson Palmer torched Notre Dame on national television and seized control of the race. Palmer went on to win the Heisman Trophy, with Banks finishing just behind. Brad Banks won the Heisman voting in the Midwest region. However, he was hurt by the popularity of Penn State’s Larry Johnson, who finished second in the Mid-Atlantic and Northeast regions, as well as the inexplicable popularity of Miami’s Ken Dorsey in the Northeast, who pushed Banks down to fourth in the voting in that region. Carson Palmer went on to defeat Banks’ Hawkeyes in the 2003 Orange Bowl and has had a decent professional career. Brad Banks, on the other hand, has probably been forgotten by many football fans nationally…but he will never be forgotten by Hawkeye fans for his one shining season in 2002. Alex Karras, Randy Duncan, Chuck Long, and Brad Banks all fell a bit short when the Heisman Trophy was handed out in their respective senior seasons. But together they remain four of the greatest players college football has ever seen.